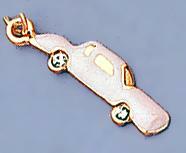 Pink Enamel Car with Crystal. Charm available in Gold or Silver. Lobster Claw jump mechanism available, cost per piece is fifty cents each, If you wish them attached to Charm. Please specify color when ordering.